Spend the day with marine wildlife and relaxing by the water with full-day access and priority activity booking at Xel-Ha. Discover natural lakes fed by an underground river and see vegetation and local animals while walking the seaside trails. 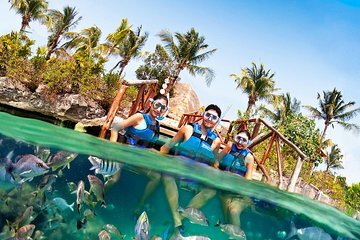 Hop into a cenote to snorkel among tropical fish and challenge yourself with leap into the water from a cliff, or by crossing hanging bridges.